“Fantastic!” I exclaimed quite loudly after paging through the backlog of Walgreens’ prior exclusives like Human Torch and Medusa. Towards the back of the shelf display, there was one Mr. Fantastic left! I have to assume he was placed there by a collector who had visited earlier and didn’t want this to be found. Well not in my town, buddy! I’m better at spotting hidden Marvel Legends than I am at ‘Where’s Waldo‘ books. I’ve caught the corners of packaging behind Oreos in the cookie aisle, I’ll check those flaps above the Toys R Us shelves, what I’m getting at is, basically, I’m a savant at eyeing hidden Marvel Legends. Reed Richards aka Mr. 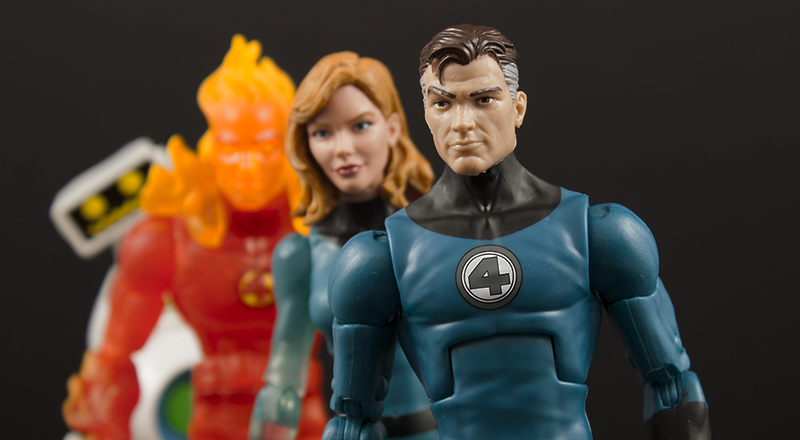 Fantastic is the third member of the Walgreens exclusive Fantastic Four Marvel Legends series. Last year we got Invisible Woman and the Human Torch. Thing is coming a little later this year, and with that, the core team will be completed! We’ll finally have a Fantastic Four team that is up to the action figure standards that Hasbro has set in the past few years. Now you may ask why this is a big deal? It’s a similar situation to the X-Men, if you take them away from us for any period of time, our desire for them will only grow. I understand that there has never been any public official stance on this, but feel free to take a look at Marvel merchandising in the last two or three years. See anything missing? X-Men have started to show back up, but the Fantastic Four are pretty glaringly absent. There is nothing. No toys, shirts, or really anything. Feel free to prove me wrong, but the Hasbro figures may be the first and only official Fantastic Four themed collectibles since 2015. Enough about that, though, let’s talk Reed Richards. We’ve come quite a ways from the weird “old-man-in-makeup” look of the first Toy Biz release. The head sculpt definitely gives me George Clooney vibes, which I think works for the character. Oddly enough, I think the Ronan wave Mr. Fantastic looked a lot like William Shatner, so really we’re just replacing famous middle-aged men with other famous middle-aged men. Both looks work, but I think this one is substantially nicer. There is that extra deco work now that Hasbro wasn’t doing back then. We were afforded a new torso with Mr. Fantastic’s release. Being that Richards is a stretchy scientist and not really known for his cardio regiment, this torso is actually perfect. He’s thin but not ripped. Unfortunately, they decided to reuse Pizza Spidey’s legs, which are very defined and clash with the aesthetic of his upper body. It would have been great if they sprang for an all-new, non-ripped, body for Mr. Fantastic. I think it would definitely have some reuse potential. Reed includes two alternate stretched out arms and the Ultimate Nullifier. His normal-sized right arm has an open hand that can hold the Nullifier. Both of the elongated arms look to be reused from the Ronan build-a-figure wave’s Mr. Fantastic. They are made of a bendy material but aren’t the most posable parts in the world. I understand why they weren’t articulated, but that doesn’t stop me from thinking a wrist cut would have made them just about perfect. Then we could have fun play options like the ability to swap in large hands, fists, or other shapes. Maybe if we get a box set in the future? That could be asking a lot given the current state of the Fantastic Four. When I reviewed Sue last year, it didn’t bother me that we were forced an invisible arm. I know some collectors were miffed we didn’t get a completely powered down Invisible Woman, or at least an arm to swap out. I get it now. We got the extra arms with Reed, and I found myself wanting those options with Sue when I pulled her back out. Would I recommend Hasbro Marvel Legends Walgreens Exclusive Mr. Fantastic? He’s the best Reed Richards we’ve gotten yet. Sure it’s possible they could improve the formula in the future, but that whole situation is still dicey. So instead let’s just live in the now and enjoy what is easily the best collection of the Fantastic Four action figures ever committed to plastic. There are no weird stylistic choices in play here, it’s just a really great collection of the team in matching outfits. Reed has begun showing up at Walgreens nationwide, or if you’re impatient you could check online.